Get both games on disc for $29.99. 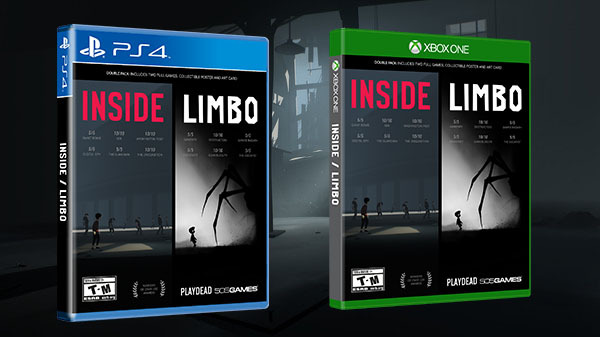 Playdead has partnered with 505 Games to bring Inside and Limbo to physical retail as a $29.99 double pack for PlayStation 4 and Xbox One at select retailers across the U.S. on September 12, and September 15 in Europe, the developer announced. In addition to the full games Inside and Limbo, the double pack will include collector’s items such as a limited run poster and art card. Limbo is an eerie black-and-white 2D sidescroller that features elements of film noir, terrific horror and haunting imagery that adds increased depth to the game’s minimalist and ambient gameplay. Inside heaves unique challenges at players navigating a stark, yet gorgeous dystopian monochromatic 2.5D environment to guide the red-shirt wearing protagonist away from nearly certain death that culminates in a heart-pounding climax.